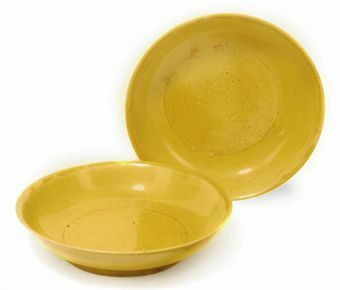 A pair of Chinese yellow glazed dishes. Kangxi period (1662-1722). A very fine and rare 'famille verte' dragon porcelain plate, china, blossom mark, kangxi period. A rare pair of finely painted wucai 'fish' dishes . kangxi period (1662-1722). Commentaires sur A pair of Chinese yellow glazed dishes. Kangxi period (1662-1722).